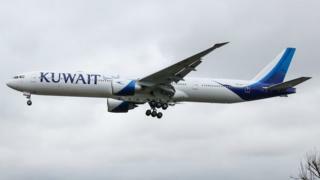 Image caption Kuwait Airways cancelled the passenger's ticket for a flight from Frankfurt to Bangkok. A German court has ruled that a Kuwaiti airline was within its rights to refuse to carry an Israeli citizen. The ruling angered Jewish groups and others, who argued that it condoned anti-Semitism. Kuwait Airways cancelled the passenger's ticket for a flight from Frankfurt to Bangkok. The Frankfurt court said the airline was respecting the laws of Kuwait, which does not recognise the state of Israel. It said it was unable to rule on Kuwaiti law, and that German law covered discrimination on the basis of only race, ethnicity or religion - not citizenship. Nathan Gelbart, the passenger's lawyer, called it a "shameful verdict for democracy and for Germany in general". "This verdict cannot stand," he said. The passenger will appeal the verdict, he said. The Central Council of Jews in Germany said: "It is unacceptable that a foreign company operating on the basis of deeply anti-Semitic national laws should be allowed to do business in Germany. "We urge the federal government to examine all legal avenues to prevent such cases of discrimination in the future." The mayor of Frankfurt, Uwe Becker, also criticised the decision. "An airline that practices discrimination and anti-Semitism by refusing to fly Israeli passengers should not be allowed to take off or land in Frankfurt," he said. The BBC was unable to reach Kuwait Airlines for comment.